A music festival in a California desert? Rihanna wears purple fur, because she's Rihanna. When your maid of honour is a superstar singer, all eyes were never going to be on you. 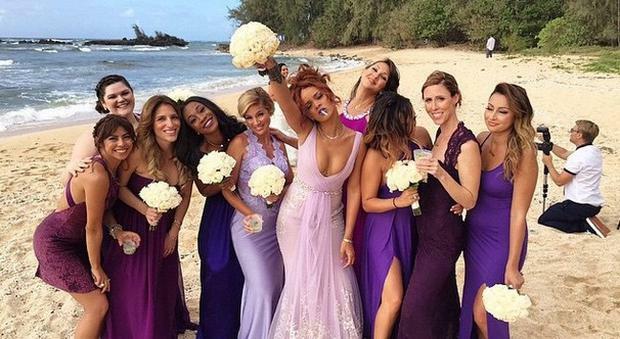 Rihanna led the bridal party maid of honour at her assistant's wedding in Hawaii on Monday. The multi-Grammy award winner stood next to her long-time assistant Jennifer Rosales as she walked up the aisle to wed Aaron Davis. As expected, the Diamonds singer managed to upstage the bride in her lilac lace Badgley Mischka gown, complementing the lilac palette of the bridal party. Also spotted at the beach ceremony was Melissa Forde, Riri's best friend. Before they exchanged vows, an emotional Rihanna shared a video in tribute to the couple, saying: "I can't believe this day is finally upon us!!!!!" she wrote in the caption. "I'm so happy and so proud to see my big sis [Rosales] and my big bro [Davis] become one today!!! "A wedding is a celebration of a marriage!!! That's what we gon do!!! Celebrate the marriage that we've been lucky enough to witness grow and evolve for all these years!!!! #420 will never be the same again!!! God bless you both!!!"